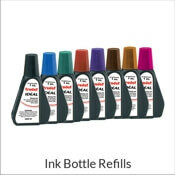 Create and purchase custom self-inking Ideal stamps. We carry all common models of Ideal stamps to customize in many sizes, assorted colors, typesetting choices, and in any quantity. 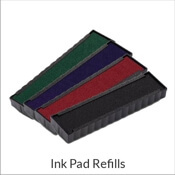 Self-ink Ideal stamps use an internal ink pad that inks the stamp after every use and last 1000's of impressions. Ideal was purchased by Trodat several years ago. Since then the product line has expanded and improved! 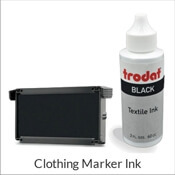 Trodat has been manufacturing rubber stampers since 1912. Today they are a world leader in the industry, selling tens of millions of stamp machines every year. While many of the stamps we manufacture are assembled using Trodat machines, on this page you can be 100% certain you're receiving a Trodat. Just enter your customization information in the fields provided and we'll handle the rest. For other models of Ideal not listed, please make a special request. We manufacture most of our round stamps in Ideal models by default and every stamp is guaranteed quality. Not sure what you want on your stamp? 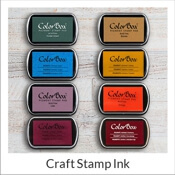 Browse our extensive selection of return address stamps or custom logo stamps.